The pancreas is a critical organ due to its role in digestive and endocrine function. Surgery for pancreatic conditions addresses either tumors of the pancreas or conditions that cause inflammation (pancreatitis). Pancreatitis may be either acute or chronic. In either case, the medical team can often manage the patient’s condition medically (without invasive intervention). However, compromised pancreatic tissue can atrophy or become infected. If the condition is severe or longstanding and resists conservative therapy, surgery may be necessary. Pancreatic tumors are uncommon but may be either malignant or benign. Malignant tumors in this organ, however, bring with them such a serious prognosis that they are one of the leading causes of cancer death. Pancreatic cancer can sometimes be treated through surgery. For more on surgical treatment of pancreatic tumors, see Aria’s Division of Surgical Oncology. 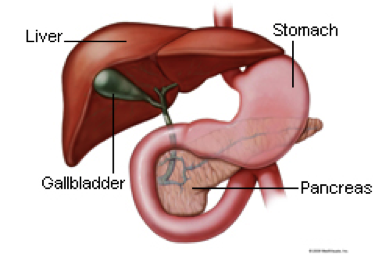 Surgery of the pancreas most often involves removing the diseased portion of the organ. These surgical procedures are major operations, requiring several hours in the operating room. Patients remain in the hospital for about a week after the surgery and will need several weeks to more fully recuperate. Other surgical procedures for pancreatitis include fluid drainage from the pancreas or surgical opening of the pancreatic duct. In some cases, the surgical team can perform pancreatic surgery laparoscopically. This makes the duration of surgery and recovery shorter. Some patients will require repeat operations to remove all of the diseased areas of tissue resulting form severe pancreatitis. In addition, many patients develop diabetes if they have lost a significant portion of their pancreas to pancreatitis or pancreatic surgery. This may partly or largely resolve, given time. When you are diagnosed with gallstones, hepatitis, or cirrhosis of the liver, it’s doubtful that you are thinking of the whole system of which the liver and gallbladder are only single parts. While these are hardly insignificant parts, it may be helpful to understand that they are important cogs in a machine known as the hepatobiliary system. This system is essential for digestion and includes the liver, pancreas, bile ducts and the gallbladder. Several ailments (hepatobiliary disease) can affect this system. Hepatobiliary disease includes a varied group of diseases of the liver and biliary system caused by viral, bacterial, and parasitic infections, cysts and tumors, toxic chemicals, alcohol consumption, poor nutrition, metabolic disorders, and cardiac failure. The two predominant diseases of the liver in the United States are viral hepatitis and cirrhosis; the predominant chronic disease of the biliary system is gallstones (cholelithiasis). The pancreas is an organ behind the stomach and in front of the spine. The two primary functions of the pancreas are to produce fluids to help break down food and to produce hormones that help control blood sugar levels. The biliary tract consists of the gallbladder and duct system. After being produced by the liver, bile is secreted into the bile ducts and stored in the gallbladder. Bile aids in the digestion of fats. Often hepatobiliary diseases require surgery as part of treatment. Dr. Matthew Johnson is a Las Vegas Board Certified Robotic Surgeon, specializing in hernia surgery, foregut surgery, and hepatobiliary surgery. He also cares for patients in the fields of general surgery, trauma & acute care surgery, and critical care. To schedule an appointment with Dr. Johnson to discuss your robotic surgery options, call his clinic at (702) 369-7152. The robot is widely used within urology and gynecology, with general surgery seen as the next frontier for expansion on the platform. There is considerable evidence that enthusiasm for robotics is escalating among general surgeons. According to the marketing division of Intuitive Surgical, the company that markets the da Vinci surgical system, general surgeons are among those most commonly completing the clinical pathway required for credentialing. Dr. Johnson has been using this minimally invasive method for several years now with excellent results. Doctors agree that it is like having a second set of hands. With assistance from robotic arms, they can make micro-movements to enhance hand maneuverability. Magnified, three-dimensional images give better visibility in small confined spaces that are difficult to see and operate in, even when doing open surgery. The robotic system is able to facilitate surgery deep in the body, giving tremendous visualization and access that was previously not possible. This has enabled minimally invasive surgery for both malignant and benign diseases. These patients can now experience the benefits of less pain and shorter recovery times. With the da Vinci Robotic Surgical System, Dr. Johnson can operate through just a few small incisions. The system features a magnified 3D high-definition vision system and tiny wristed instruments that bend and rotate far greater than the human wrist. As a result, it enables Dr. Johnson and other surgeons to operate with enhanced vision, precision, dexterity, and control. Minimally invasive da Vinci uses the latest in surgical and robotics technologies, and is beneficial for performing both routine and complex surgeries. 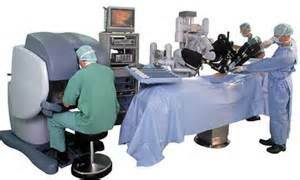 As with any treatment option, robotic surgery may not be appropriate for everyone. You should discuss treatment options with Dr. Johnson to find out if you are a good candidate for robotic surgery.